If you are planning to go for bridal shopping in Mumbai, then you must check out these 10 best lehenga shops in Santacruz before buying your wedding lehenga. Right from heavy designer lehengas to modern lehenga designs, you will find all your wedding shopping needs in the lanes of Santacruz. To make buying lehenga in Mumbai easier, we have curated this list, which has a range of latest lehenga designs suited to fit all kinds of budget. Trivia: Did you know that Santacruz is one of the biggest lehenga market in Mumbai ranking even before Dadar? Well now that you know, scroll down to glance through the best bridal wear shops in Santacruz, Mumbai and visit the one you like the best! Whatever your taste be in bridal lehengas, you will find just the perfect one to match your style at Kalakruti in Santacruz. They have all kinds of bridal lehengas that are ideal for all your wedding occasions including mehndi and sangeet! Store Timings: Monday - Sunday 10 a.m. to 8.30 p.m. If you are looking for designer bridal lehengas in Mumbai, the the Veer Design Studio in Santacruz is your place to go! They have latest lehenga designs 2018 that are sure to match every modern bride’s style. If lehengas are not your taste and you are looking for western gown shops in Mumbai, then Veer Design Studio has a wide range of those too! Check out their entire collection here! Store Timings: Monday - Saturday 11 a.m. to 9 p.m.
Whatever be your requirement while shopping for bridal lehenga in Mumbai, Raas at Santacruz has an outfit for all your needs. Be it a heavily embellished lehenga for your pheras or a light banarasi lehenga for your mehendi, Raas has it all. Kalki is one amongst the top favourite Santacruz lehenga shops for Mumbaikars while shopping for bridal wear. And why shouldn’t it be? 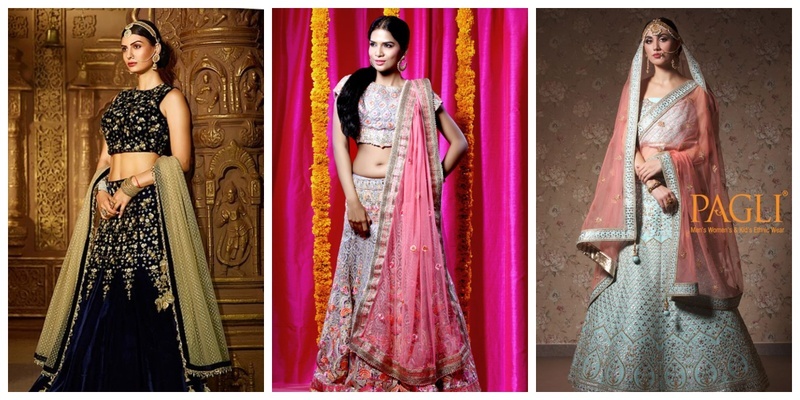 Kalki bridal lehengas are so beautiful that you would want to buy them all! You can even check out their collection here! One of the best bridal wear shops in Santacruz Mumbai, Pagli has a huge range of bridal lehengas that are priced in wide category to suit all budgets. If beautiful karigari, vibrant colours and perfect fitting are the things you require in your wedding lehenga, then Pagli Santacruz is a must visit. A name synonymous with style and luxury, Seasons Santacruz price range for lehengas starts at Rs.16,000 onwards. Seasons Mumbai bridal wear is amongst the most sought after showrooms for wedding shopping since it is a one-stop destination for wedding outfits for all occasions. If finding a cheap lehenga in Mumbai is getting difficult for you, then wait for Seasons annual sale, where you can get amazing bridal lehengas at affordable prices. Bawree Santacruz is your go-to shop for not only bridal wear but for any kind of festive shopping. While they have a huge stock of bridal lehengas, they also have beautiful gowns, shararas and dresses for bridesmaids or the bride’s mother too! Store Timings: Monday - Sunday 10 a.m. to 9 p.m. If you are looking for cheap lehengas in Mumbai, then Roopkala at Santacruz has bridal lehenga options starting from a price range of Rs. 9200 upwards. Right from Banarasi lehengas to high-end silk lehengas, you will find the perfect outfit in your budget at Roopkala! View their lehenga images with price here! Magic Mirror in Santacruz is for the bride who prefers minimalistic style over traditional. They have beautiful bridal lehengas in a wide range of price to suit all budgets. What’s more? They also have sarees, gowns, costume jewellery and salwar kameez, making it a one-stop-shop for bridal shopping in Mumbai. Panihari in Santacruz is a good place to shop if you are looking for traditional bridal lehengas with classic embroidery and bright colours. They also have a good range of sarees, designer churidar and salwar kameez that you can shop for the bride’s family members or bridesmaids! Store Timings: Monday - Sunday 9 a.m. to 9 p.m. So where are you going for your bridal shopping in Mumbai?